Out Of Print! 3 Left! 40% off! Has Been Replaced With New Edition! 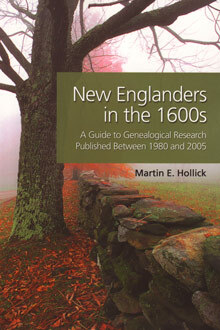 New Englanders in the 1600s: A Guide to Genealogical Research Published Between 1980 and 2005 will help researchers find the best current genealogical writing about seventeenth-century New England families. All levels of researchers, from the beginner to the professional, will find the book helpful for finding articles, single- and multi-family genealogies, and other scholarly compendia covering New England immigrants born before the year 1700. Entries are alphabetized by surname; each entry contains enough information for you to locate the research that has been done on that particular person, and also indicates which publications mention other family members, ties to royalty, full-family genealogies, and/or DNA studies. Mr. Hollick, a professional genealogist, has included listings for over 3,600 families.